Pilates vs Yoga: Equal but not the Same! Pilates vs Yoga are two different styles of exercise that give you some of the same benefits, but still have very different results. Pilates and Yoga workouts differ in the speed and intensity of the exercises. Yoga means union of mind, body, and spirit that involves practicing poses or postures (asana’s). In most forms of yoga static poses are held and moved into more deeply as you breath. Yoga creates balance through the strength and flexibility you develop in the poses. It is not only about stretching but inner strength and balance as well. 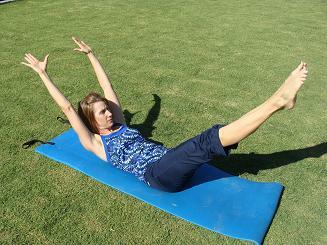 Pilates ab exercise involves a fluidity of movement flowing from one exercise into another like the double leg stretch shown here. It is a mind-body style of exercise, which means the mind is focused on controlling the movements of the body. There are few repetitions and hundreds of movements and variations that can be worked into. The breathing again efficiently moves the body from one precise exercise into the next working the whole body in the process. The focus is always on stabilizing the core, pelvis, and shoulder blades while flexing, extending, or rotating the spine and limbs. 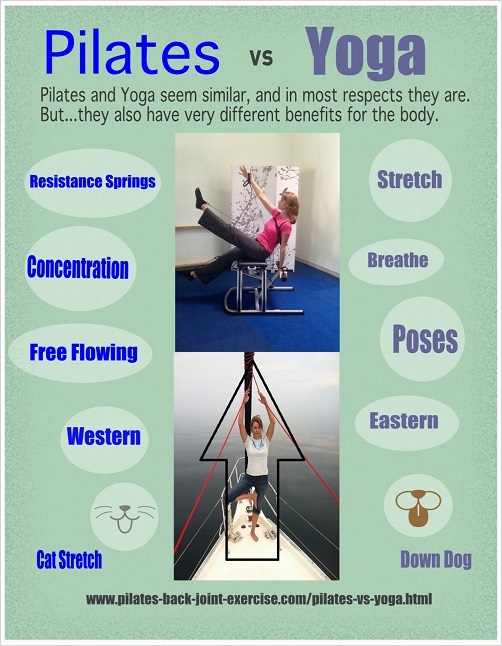 Yoga vs Pilates style of breathing has similar and different effects. Yoga breath comes from the nostrils. When you breathe the inhale and exhale are done through the nostrils feeling the belly inflate and deflate like a balloon. This is the most common Yoga breath and it helps to calm the mind, stimulate clear thinking, and reduces stress and anxiety. Pilates breathing involves inhaling deeply through the nose, filling up or expanding your ribcage into the back and sides. Pilates exhale is through the mouth, which gives an abdominal connection important to stabilize the spine during the hardest part of a movement or the twist or bend. Pilates style of breathing stimulates and energizes the body through systematic series of exercises that allow you to move fluidly and precisely from one move to another. A good rule of thumb when exercising, especially when doing Pilates is to inhale as you prepare for a movement or when you are extending your spine. Exhale through your mouth to initiate the movement or when you are flexing your spine. When you breathe this way as you do Yoga and Pilates the movements become more efficient and meditative. Check out my Pilates Healthy Back and Joints Dvd here! Pilates vs yoga exercises offer you similar, but different results. They both work to improve your flexibility, as well as strength, but in different ways. Yoga offers you whole body strength from mostly holding static poses that focus on stretching and strengthening the muscles to their end points creating balance in the body. For someone who is very inflexible this would be a great system of exercise to help increase flexibility in and elongate the tight muscles. Pilates offers you whole body strength and flexibility exercises with the added challenge of controlled movements utilizing spring tension (resistance) such as this Pilates Reformer Stretch. This system of exercise is good at rehabilitating the length/tension imbalances in the body through the stretching and strengthening of the muscles in their elongated state. Check out some of my Pilates Reformer Workouts here to see how the spring tension can stretch and strengthen you! 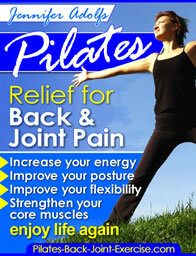 The history of Pilates vs Yoga exercises involves a meditative form of exercise versus a restorative exercise system. Yoga may go back as far as 8,000 years ago to the stone ages on the Indian Subcontinent. It is considered as an eastern form of meditation and mind-body-spirit exercise system. It has been carried down by hundreds of master’s through the centuries. 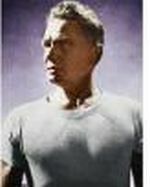 Pilates was developed in the early 1900’s by a German (Joseph Pilates) who utilized some of the benefits of Yoga to develop a system of exercises to rehabilitate and realign the spine and muscles in the body. Pilates is considered a mind-body form of exercise with the mind always being focused on the precise movements of the body. He has fewer than 10 original students who are carrying on his legacy. Leave Pilates vs Yoga and find out more about how Pilates can benefit you.